Dobuhont professional noise cancellation headphones with microphone and remote, let you switch easily between calls and music on your smart phone. It is a wired earphone, using the leading multi-stage active noise cancelling dual-feedback technology, so it is much more stable than a Bluetooth noise cancelling headphone, and won't produce unbearable screaming sound. This wired ANC headphones can reduce surrounding noise max up to 36dB, shut out the world and lose yourself in your music--or let the world in. It is ideal for select iPod, iPhone and iPad. It is engineered to sound better, be more comfortable. Put them on, and suddenly everything changes. Your music is deep, powerful and balanced, and so quiet that every note sounds clearer. Even air travel becomes enjoyable, as engine roar gently fades away. No matter how noisy the world is, it's just you and your music-or simply peace and quiet. ADVANCED ACTIVE NOISE CANCELLING TECHNOLOGY-This wired noise reduction headphones has significant noise reduction in subway/metro/bus/ airplane cabin, city traffic or busy office; help you focus on what you want to hear, enjoy your music, movies and videos. 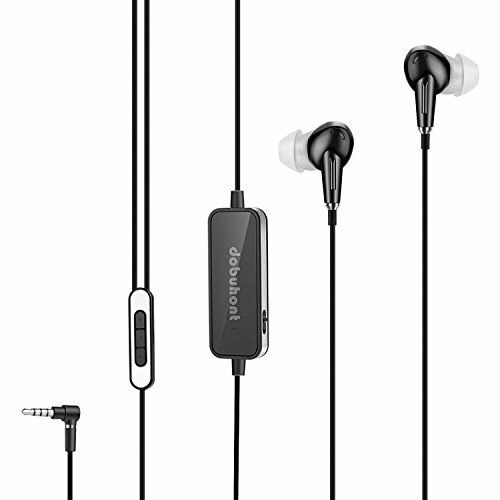 USING SMART 3D MUSIC CHIP- Giving you Hi-Fi and powerful sound quality, helps you enjoy the music on the go while the noise around you is diminished--from the comfort and convenience of an in-ear headphone. ULTRA COMFORT AND ERGONOMIC DESIGN- Perfect ergonomic design provides more comfort and stability for your ears. Large/Medium/Small three pairs of silica gel earbud covers to suit all ears, provides a soft and secure fit. 20 HOURS PLAY TIME- A built-in 200mAh lithium-ion battery won't allow your headphones power off, you can enjoy your world without noise for 20 hours. Great for traveling, work or anywhere in between, also perfect for daily use. And even when the power is off or the battery runs out, you can still use these headphones to enjoy quality sound. BUILT-IN AWARENESS MODE- Clearly hear airline or subway announcements, when ANC is on. You never worry about miss any important announcement. If you have any questions about this product by Dobuhont, contact us by completing and submitting the form below. If you are looking for a specif part number, please include it with your message.